This is the re-worked and re-edited second part of Deadlier Than The Male. Hazel, now known as Red, fulfilled her destiny and took up the mantle of Sentinel Exemplar – the first and only Wolf to hold the position. She adopted her nickname of Red and continues to fight for her Lycaeon and society in general, keeping both safe from the threat of human discovery and intervention, and from the very real threat of Throwbacks and usurpers. 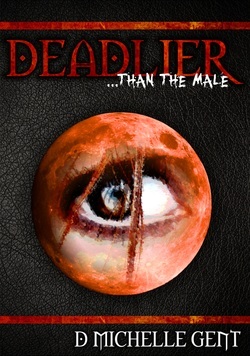 This is the re-worked and re-edited first part of Deadlier Than The Male. This is Hazel’s story of how she became one of the most powerful Wolves in werewolf society; The Prophesied One. Set in the 15th century, this story follows her violent beginning and the true ways of the werewolf, their rules and society are shown in vivid, captivating detail. The Wolf society runs alongside our own; violent, bloodthirsty and deadly but with a structure and order unmatched in the human world. What do you know about the society you live in? What other societies share the same living space as you? None? Guess again. Werewolves are make-believe, they don't exist. They are legends from times gone by when science was as accurate as horoscopes are today - but even horoscopes can hold a truth. You think you know your neighbours, your town and your surroundings; but everyone has a secret, some are darker than others. Hide in plain sight. Keep everyone in the dark; give nothing away. Leave no witnesses. These are the rules governing a society that exists within our own. Despite what you believe, Werewolves are real. They live amongst us and have fought for and against us for millennia. Legends of Wolves roaming the lands which were once named Sherwood Forest are just stories... Aren't they? Tell that to the young women who have been brutalised, their skin and flesh shredded from their bones with the finesse of a skilled and ruthless butcher. He made sure the girls were going to die, but later rather than sooner. A sadistic attacker is on the loose - could the cure be worse than the symptom? You don't believe it? Not in this day and age? Guess again. This is the first in Michelle's werewolf series. To order a signed copy select delivery destination and the dedication if required below.